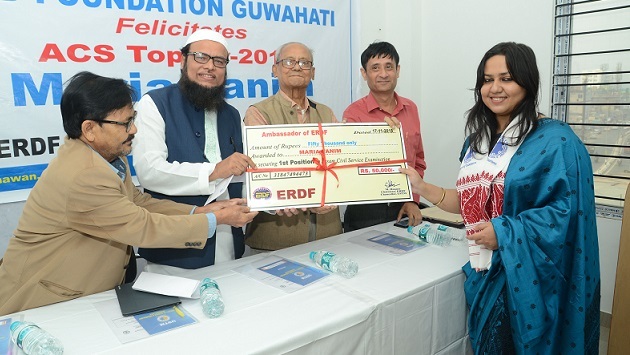 Maria Tanim, the topper of Assam Civil Service (ACS) Examination 2016, results of which were declared by Assam Public Service Commission (APSC) on Friday, has received a grand felicitation and cash award here on Saturday at the ERD Foundation, Guwahati. Maria and five more students have cleared ACS this time from FACC, the competitive examination coaching centre of ERDF. All the achiever students were felicitated and were paid back their entire coaching fees. Mahbubul Hoque, Chairman, ERD Foundation, on Saturday felicitated and handed over cash award of Rs 50,000 to Maria Tanim for her outstanding performance in the competitive examination. Maria is the daughter of Kutub Uddin Barbhuya and Ismtara Barbhuya and she hails from Hailakandi. Sailen Baishya, the coach and Director of FACC, was also felicitated and rewarded Rs 50,000 for his constant effort and dedicated commitment towards teaching and guiding the students. Students from FACC, who have come with flying colours in the APSC 2016 examination are: Koustabh Roy(ACS), Namrata Das(ACS), Moonsoon Barkataki(ALRS), Mausum Pratim Nath (ACS)and Raj Ballabh Mahanta (AEO), stated an ERDF press communiqué. “Poor meritorious students who want coaching and guidance are invited to approach ERDF for educational support,” said M Hoque. Sailen Baishya, the Director of FACC saidthat for exams like civil services, preparation duration should be long, for example, 12 to 18 months to get a good result. Reading NCERT books from school level is very essential.